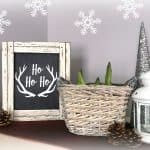 I have fallen in love with the latest farmhouse style craze and I wanted to bring farmhouse style outdoors to my deck! 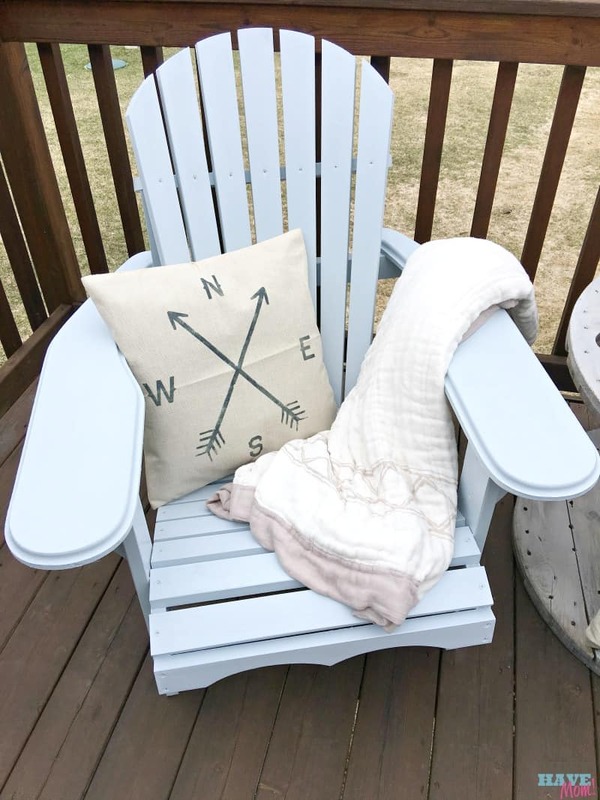 These DIY farmhouse style adirondack chairs were just what my deck needed. I’ll show you how to make them yourself! I love grabbing a comfy chair, a good book and a cold glass of strawberry green tea and watching my kids play outside while nestled comfy and cozy in my chair. 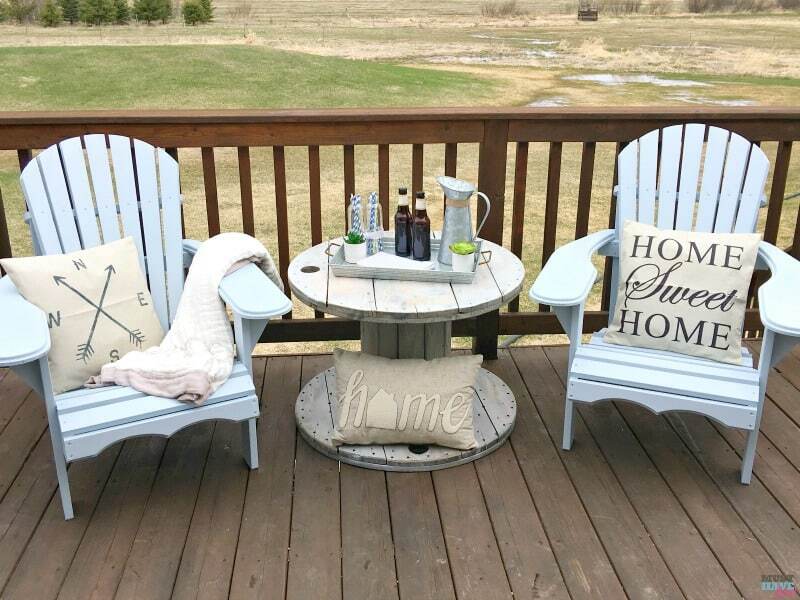 These DIY farmhouse style adirondack chairs are the perfect place to plop down all summer long. I LOVE how the farmhouse style really came together in the final look too. Want to make some? 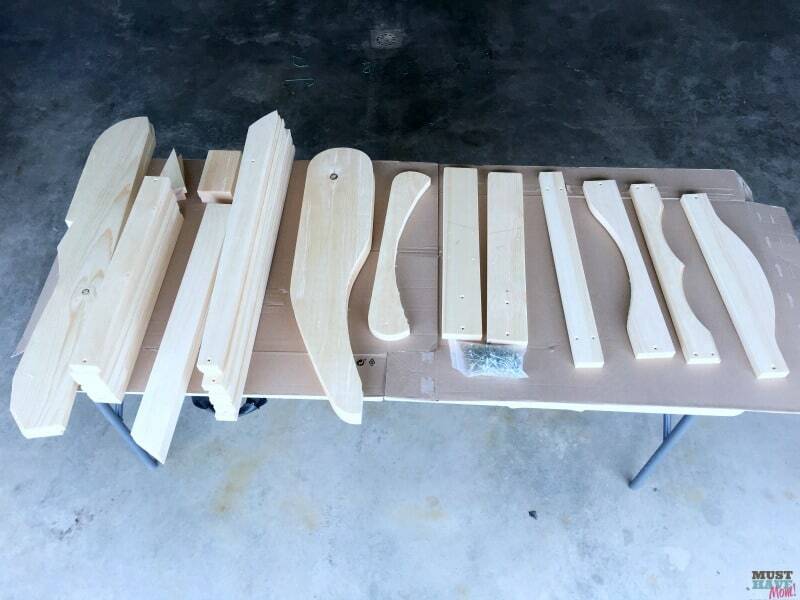 We started with these unfinished adirondack chairs from Wayfair. They arrived unassembled and were pretty straightforward to put together. First we laid out all of the pieces. 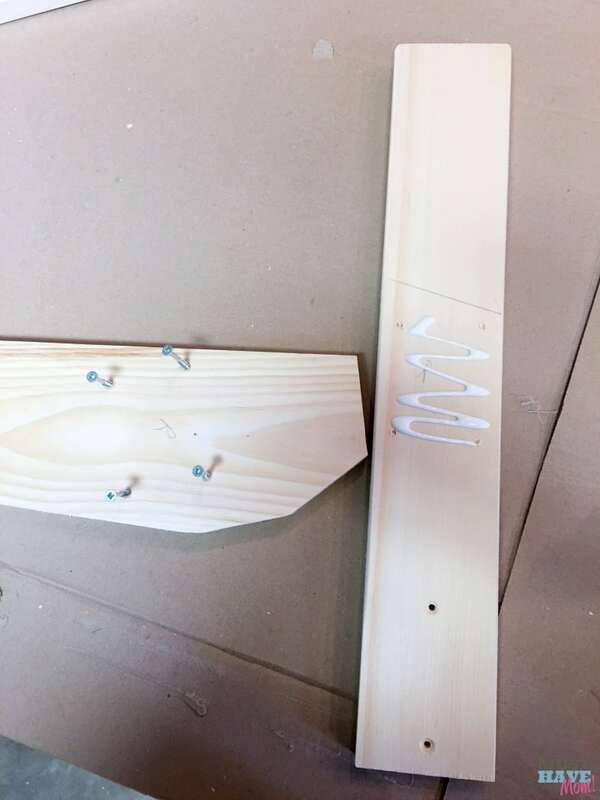 We followed the step by step instructions and made sure to glue all of the joints before screwing the pieces together. Use a quality wood glue and don’t skip this step! It will help ensure that your chairs hold together well and don’t become unsteady after using them for awhile. It’s worth taking the extra time to do it. 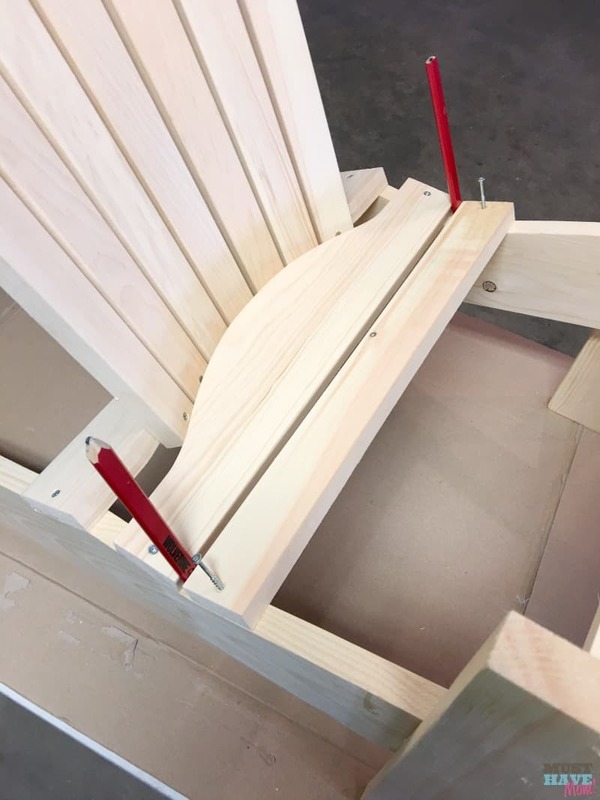 When putting the slats for the seat on we found it very helpful to simply use a carpenter’s pencil to measure equal distances between each of the slats. Once you complete the assembly (which took us about an hour) it was time to move on to the fun part, painting! I picked up a high gloss outdoor paint by Valspar. I went with a very light blue color with slight gray tones in it. 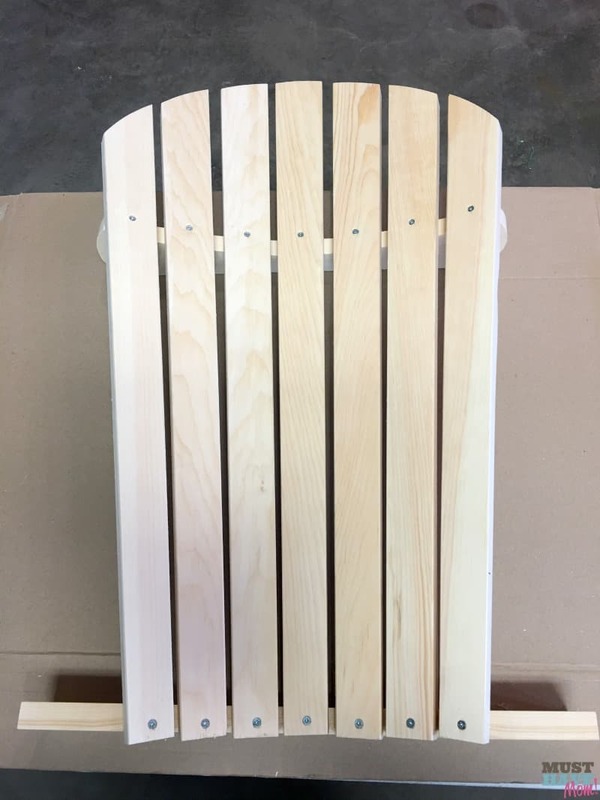 A quart was able to cover two adirondack chairs with 2 coats on each chair. You’ll also need a paint brush, paint stick and paint key or screwdriver to open the paint can. I also found it very helpful to use a very small paint brush to get into the areas between the slats. Alternatively, you could paint each piece before assembling it. It’s really up to you which way to do it as they both work. Once you’ve applied two coats of paint then you’re ready to relax! Add a comfy throw pillow and blanket and you’ve got the perfect spot to sit back and relax. I opted to go with a very farmhouse style pillow with a burlap-looking fabric and compass print on it. 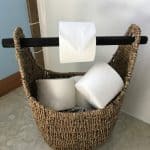 You can find a great selection of burlap pillows on Wayfair to style your adirondack chairs with. 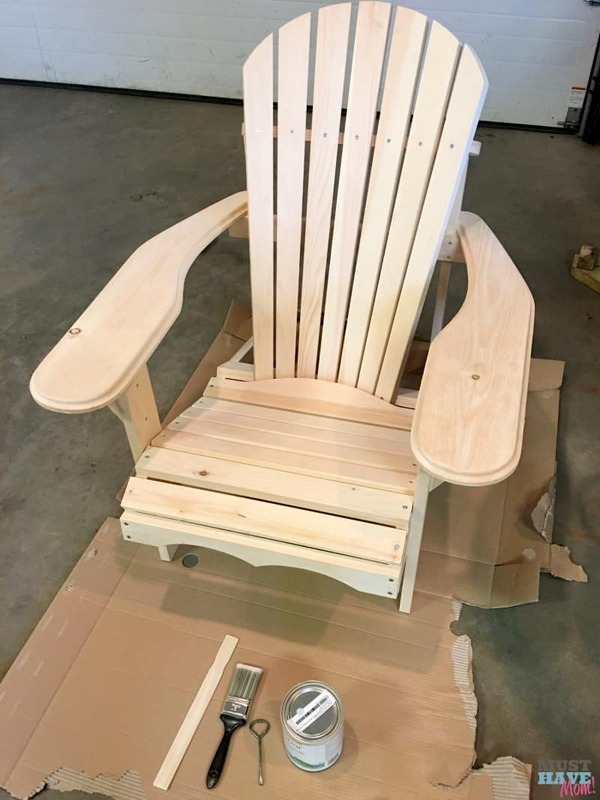 In the center of my two farmhouse style adirondack chairs I added a DIY wood spool (tutorial coming soon!) for the perfect outdoor table! Add a tray of beverages and you’ve got the best spot in town! 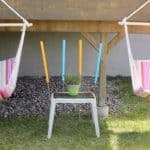 Does your patio furniture need a facelift? Try adding some farmhouse style to your deck! These look fabulous! You did such a great job!! These chairs are rally neat! I would love to have a couple of these. 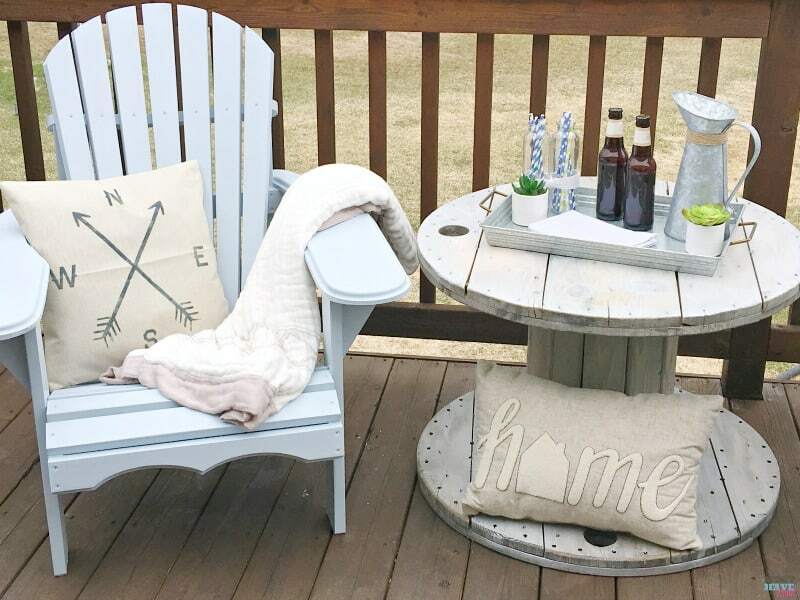 You did a nice job on the Adirondack chairs, and the burlap is perfect with this decor. The spool table brings back memories, as newlyweds, we found a discarded spool table, and had jazzed up crates for dining chairs. We were on a small farmhouse with 27 acres, in a college town and lots of cows. That is so awesome Rosie! Who knew that would be the new trend huh? You were ahead of your time!